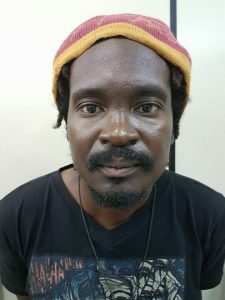 A Guyanese man has been arrested in neighbouring Brazil for setting fire to homes where Venezuelans are seeking refuge in Boa Vista, the capital of Roraima State, media reported. He has been identified as 42-year old Gordon “Jamaica” Fowler. He was arrested by the General Homicide Office of the Civilian Police at about 9 O’clock Saturday night in the Mecejana neighborhood, where the attacks took place. The defendant is expected to answer two attempted murder charges- triple attempted murder for the last attack that hit the Venezuelan family, and double attempted murder of the two people he hit in the first attack. Also, according to police information, at the time of the arrest, Fowler wore the same clothes as the man who appears in the security camera footage during the second attack. 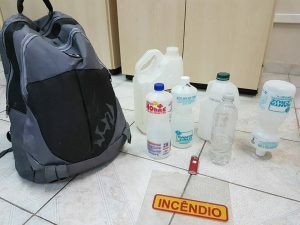 The items that Brazilian civilian police said they found in possession of Guyanese Gordon Fowler. Police said he has since confessed to the crime and said he had nothing against the victims, but he felt angry with the Venezuelans after a misunderstanding and having his bike stolen. In his testimony, he said that the victims were chosen because they were easily accessible, sleeping in semi-open spaces, without doors or windows, and staying overnight in the Mecejana neighborhood, where there are several abandoned properties. There are thousands of Venezuelan refugees in neighbouring Brazil, having fled political and economic troubles in their homeland.